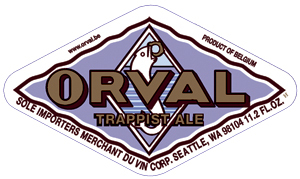 Orval was founded in 1070 and the current brewery was completed in 1929. The Trappist ale is dry-hopped and fermented and bottle-conditioned with an ale yeast and Brettanomyces. Oh, Orval, we meet again! It’s been too long, and you haven’t changed a bit. Your handsome burnt amber body still elegantly supports that frothy crown you wear so proudly. Hints of lemon zest, oranges, spice, leather and hay still swirl around in your presence as your yeasty goodness shines in both aroma and flavor. Even today, you are effervescent in character, although your demeanor seems a less sour than it did long ago. Perhaps life has altered us both a bit? Nonetheless, I always enjoy your signature crisp, clean finish, an unusual attribute for a world-class Belgian like yourself.